Despite the inclusion of dates and walnuts, this traybake does not taste anything like a sticky date pudding. While to some that could be considered a disappointment, it has a rich nutty flavour all it’s own which pairs beautifully with a smooth coffee on a chilly winter morning. The dates give a lovely sweetness and the walnuts a pleasant crunch. This is a traybake even those who dislike dates will enjoy. Pre-heat your oven to 180°c or 160°c fan-forced and grease and line a 30x23cm baking tray or roasting tin. Place the chopped dates and butter in a small bowl and pour the boiling water over the top and stir well. Set aside and leave to cool. Whisk the eggs and sugar together in a separate bowl, stir in the date mixture and add the remaining cake ingredients. Stir until just combined and then pour into the lined pan. Bake in the oven for about 30 minutes. The recipe calls for 1 hour and 10 minutes of cooking but for me the cake was beautifully done at 30 minutes so do check the cake regularly! A skewer inserted into the middle should come out clean. Let it cool in the tin for 10 minutes before removing from the tin, peeling off the baking paper and placing on a wire rack to cool completely. While it cools, make the icing by mixing the sugar with the lemon zest and juice adding a dribble of warm water at a time until you reach a smooth spreading consistency. I only made half the amount and found it adequate to give a thin cover. If you want a thicker layer, feel free to make the entire amount. Decorate with walnut pieces as desired and cut into 24 pieces. 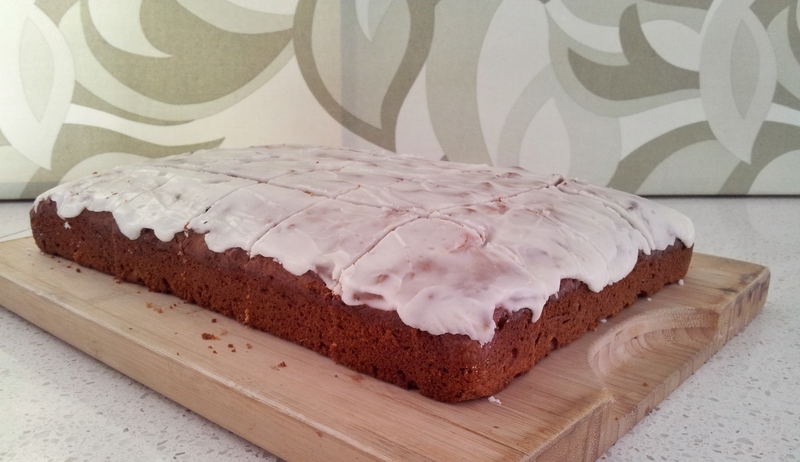 I didn’t use the icing for this tray bake altho’ the cake might well have benefited from a little sharpness from the lemon. Like you, I’d be reluctant to use that much icing sugar and, in the future, might use some lemon-flavoured thick yoghurt/creme fraiche as a side with it. I don’t know whether it’s because of the ground almonds but I think this date and walnut tray bake needs to stand for a few hours/overnight for the flavours to blend together well. 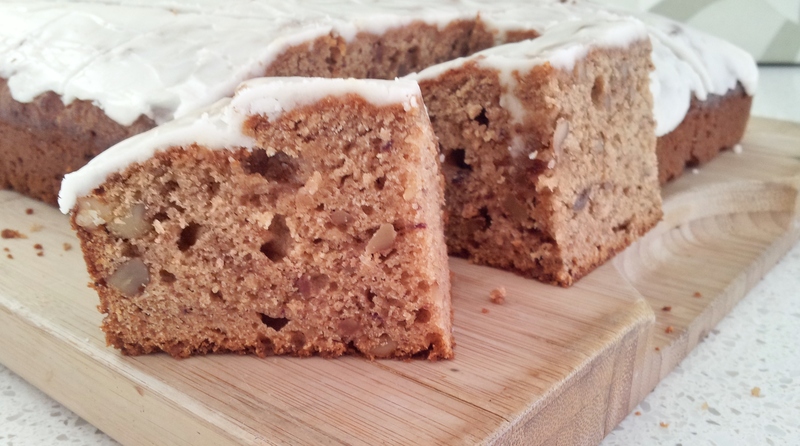 It’s a good, flavourful version of date and walnut cake, and it keeps well, but that amount of nuts does make it relatively expensive which might sway the decision if people already have a favourite version of this. Is the butter measurement wrong for this recipe, seems low when I look at flour and sugar being much higher doesn’t seem right. The butter measurement is correct. The butter, boiling water and dates are combined before we put the batter together, and they meld together to form a sugary liquid. If you like dates, you’ll love this slice! I hope you give it a go and let us know what you think. How many calories are there per slice? Looks very nice. Not tried it yet. If you cut the slice into 24 pieces, one un-iced piece is 213 calories. The total tray is 5126 calories.